A remote work setup provides several advantages. However, it also comes with drawbacks and pitfalls. To make sure that you reap the benefits and evade potential problems, there are do’s and don’ts to consider. The following points should serve as a useful guide in managing remote teams across different settings. Communication is extremely important in a remote work setup. It can spell the success or failure in the management of telecommuting teams. That’s why having effective internal team communication is a must, and it only makes sense of adopting an unambiguous communication playbook. There needs to be a unified and systematic way for everyone in the team to communicate. Managers should lay out a dependable process for contacting each other, for managers to reach employees, for employees to raise concerns, and for everyone to be able to respond accordingly. Choose priority means of communication. Decide if the team should stick to using Gmail and Google Hangouts or everyone should also have Skype and a conventional telephone or mobile phone number. There are many ways to communicate, but it’s important to choose one or two platforms as the priority methods. This is important to have consistency and to make it easy to track correspondence or calls. It would be difficult, especially for managers, to keep up with the telecommuting team if there are different platforms employed. It is inefficient for management and can be taxing on computing resources to boot. Imagine an accommodating manager who has to install and regularly run multiple messaging services (Facebook Messenger, Skype, WhatsApp, WeChat, etc.) to be able to communicate with team members. More is better. While it’s advisable to choose particular communication platforms to use, it wouldn’t hurt having several other ways to contact each other. If one becomes unavailable, it is advantageous having other means to send messages or make calls. This does not mean running all messaging services at once. It is about having another contact option when it becomes difficult to reach someone through the usual methods. As much as possible, everyone should be able to communicate through traditional telephone or mobile phones. Don’t rely on email and web messaging. Not everyone can be online all of the time. There have to be non-online ways to reach employees especially when there are emergencies or urgent tasks. Require everyone to confirm the receipt of messages. When sending emails or when using communication methods that don’t entail instant responses, it is important for receipt confirmations to be sent in response. Confirmation, or the lack thereof, will alert managers of what to do next. Likewise, it tells remote employees to follow up or resend what they are supposed to send. Create standard processes for different kinds of communication. For example, when submitting reports, aside from having deadlines, there has to be a specific mode of transmission and format of the report. Additionally, the receiver should confirm receipt upon getting it. Another example: when a manager and a remote employee discuss a task, the results of the discussion or the points decided upon should be converted into a new task expected to be completed within a specific timeline. All team members should be made aware of short-term, mid-term, and long-term goals. At the same time, the management should present expectations to serve as a guide for remote workers. Managing remote teams is not a one-way street. Cooperation is a must so everyone should know what needs to be accomplished and how they are expected to attain team objectives. It helps to have a private online page (accessible to remote team members) that tracks the goals and expectations set for a team. This can help motivate employees and create a sense of achievement as items on the list are slowly crossed out. Choose a reliable remote work software. It’s not compulsory to get a remote work software to be successful in managing remote teams. You can use a combination of different software and web services in lieu of a single telecommuting software platform. For example, you can use Google Drive (including Google Docs and Google Sheets), Gmail, and Google Hangouts to manage a team of online content writers or even a group of remote translators. You can creatively take advantage of the different free online services and apps to facilitate remote team operations. The software should have SSL encryption and be proven free from malware or backdoor channels that compromise your data. Never use a telecommuting platform that is known for occasional crashing, stability issues, or bugs. If it is web-based, it should have very minimal downtime or offline times due to server maintenance. It should be intuitive or easy to use. Learning its different features and functions shouldn’t take a long time. All of the important functions should be present. These include an efficient system for managing assignments or task queues, messaging, collaboration, file sharing, screen sharing, as well as invoicing and the ability to integrate with other applications. It would be great if you can find a freeware but it wouldn’t be a bad decision spending for the software if it is guaranteed to be secure, reliable, intuitive, and complete with the features you need. Working with remote employees is challenging because of the physical distance. It’s difficult to communicate or conduct meetings even with all the advances in communications technology. Communication systems can encounter problems or employees can always make up excuses for being “un-contactable.” It’s completely different from simply summoning someone who is in another room or office. That’s why managing remote teams entails more than the usual follow-ups and following through. For managers, this is necessary to have the assurance that tasks are completed as expected. For remote employees, especially those who have self-discipline issues, this helps in setting the pace and ensuring that they are properly guided on what should be done. This does not mean that you shouldn’t trust your remote employees. However, it’s better for a manager to be perceived as an annoying superior rather than risking the completion of tasks or the quality of the output. 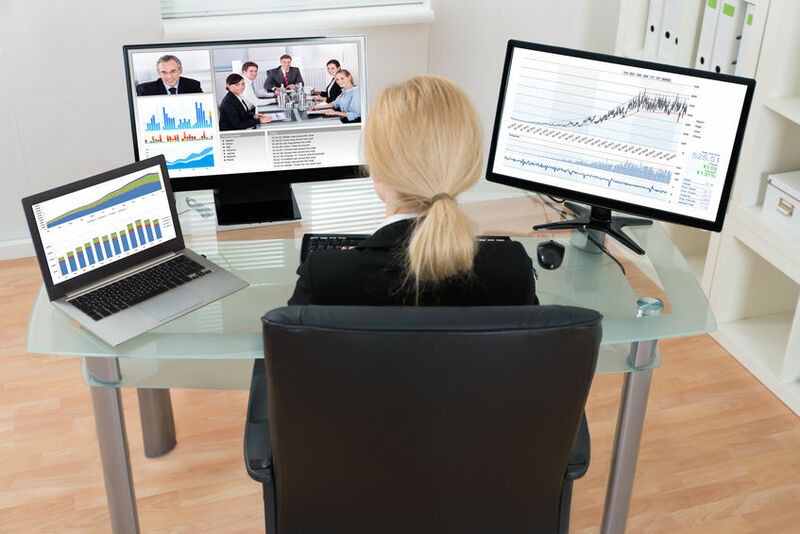 It is advisable for remote team managers to be involved in every step of the project instead of assigning tasks and expecting an output at a deadline. Giving remote employees the full trust that they would deliver what’s expected of them, as much as possible, should only be done after they establish a good track record. Even if you hire the best possible telecommuters, there’s no guarantee that they will always be able to complete what they need to do. You don’t necessarily have to abandon your trust for people; don’t trust that everything will proceed as expected. Technical issues, calamities, accidents, illnesses, and other problems can stand in the way of dedicated, hardworking remote workers. While it is advisable to regularly keep posted with the progress of tasks or a project, you should not overdo it. It’s unnecessary and can be irritating (for teleworkers) to demand updates every hour unless an output is urgently needed. Eventually, you should be able to assess the performance of your remote team and determine if you can trust them enough to complete tasks on time without the constant heads up. Following up and following through are different from unnecessarily requiring remote workers to send reports every so often. Make sure that the goals and timelines of a project are reasonably achievable. It’s not a good idea setting deadlines earlier to rush employees and extend the deadline because of the failure to get tasks done on time. Some managers try to trick employees into thinking that they are already way behind schedule to force them to expedite the delivery of the expected output. This strategy can become counter-productive in the long run, though. Employees may no longer take deadlines seriously as they realize, based on experience, that deadlines are often reset because they regularly fail to fulfill the unrealistic requirements. This is a no-brainer but worth emphasizing. If you demand good performance from your remote team, it’s only logical to treat them well. Promptly address their complaints or concerns. Don’t coldly admonish or penalize them for mistakes or failures without hearing their side as this can create unnecessary conflict or a sense of hostility. Send them their pay on time. Never treat them with disrespect and arrogance as these can be reciprocated with poor performance. Managing remote teams is not going to be easy. There are many challenges along the way. Be prepared for these and try to make it work. If there are concerns from employees, address them accordingly. If inefficiencies are encountered, take the time to analyze the situation and implement the necessary tweaks or changes. If you picked the wrong people to work from home, replace them. Unlock the full benefits of a remote work setup by paying close attention to the things you should and shouldn’t do as a manager. Ensure good communication, be transparent, use an excellent remote work software, and stay in control. Meanwhile, don’t be complacent, excessively fixated with updates, negligent in your responsibilities to your remote team, and quick to be discouraged or demotivated. Previous post 10 Tips on How to Make Meetings More Productive and Effective Next post Is the 9-to-5 Work Setup Heading for Extinction?